We’re headed to North Fremantle once again for our 11th annual celebration of the sounds of the port city on Saturday, June 17. 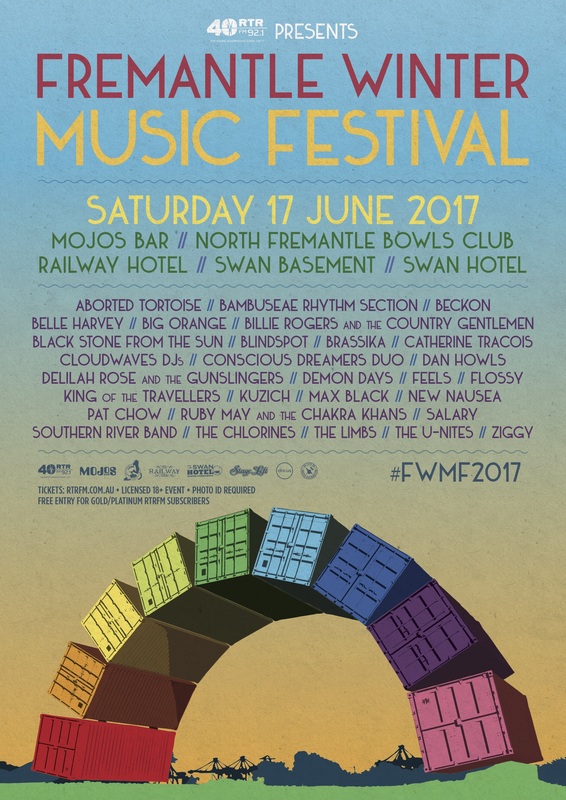 Featuring over 20 acts, FWMF will take over five of Fremantle’s favourite venues – Mojos, North Fremantle Bowls Club, the Railway Hotel, the Swan Lounge and the Swan Basement, running from 7pm ‘til late. Roll into North Fremantle for the Fremantle Winter Music Festival 2017 – bigger and better. The biggest local music event in the port city. WHO: Aborted Tortoise, Bambuseae Rhythm Section, Beckon, Belle Harvey, Big Orange, Bille Rogers & The Country Gentlemen, Black Stone from The Sun, Blindspot, Brassika, Catherine Traicos, Cloudwaves DJs, Conscious Dreamers Duo, Dan Howls, Delilah Rose & The Gunslingers, Demon Days, Feels, Flossy, King of the Travellers, Kuzich, Max Black, New Nausea, Pat Chow, Ruby May & The Chakra Khans, Salary, Southern River Band, The Chlorines, The Limbs, The U-Nites and Ziggy Ramo. TICKETS: Presales $15 RTRFM subscribers, $20 general public via rtrfm.com.au. Limited door sales available on the night. Gold/Platinum subscribers receive free entry.